Home » Personnel » Working conditions » Hoisting and lifting, working at a height and transport » Transport, what do I need to look out for? Never lift up more than 25 kg unassisted. 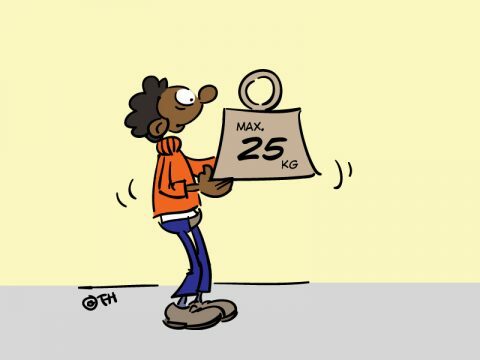 Use appropriate equipment for loads heavier than 25 kg. Use fitting and appropriate transport material. When lifting think about the strain on your body. Ask your supervisor or health & safety coordinator for training in lifting. Do not lift up more than you comfortably can; a guideline is 25 kg. Lift less if you are in a slanting or bent-over posture. If you are pregnant, avoid lifting as much as possible. Stack the material to be transported safely and make sure no parts are sticking out. Adjust your speed to the situation and take the weight of the load into consideration.